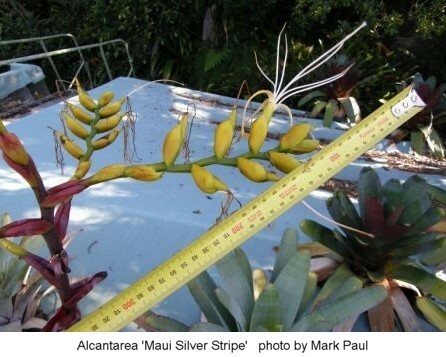 From Geoffrey Lawn, BSI Cultivar Registrar... "In about 2004 Mark Paul was in Hawaii. 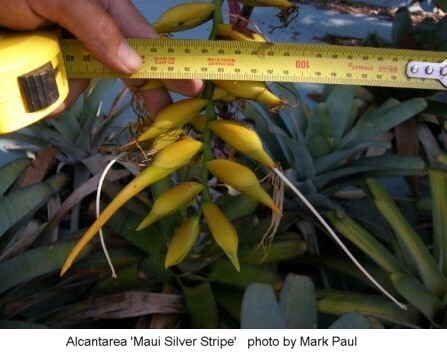 He collected seed from flowering plants with no other Alcantarea in sight at the Iao Valley arboretum on Maui Hawaii. This arboretum is run by some orchid collectors and they had no site locality details available, other than it had been collected as seed with orchid seed from Brazil. There were a group of seed grown plants that had first flowered together at the end of 2008. 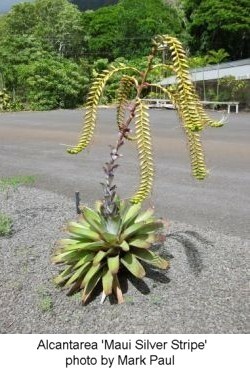 It is a yellow flowered extensa type with elongated lyrate branches and enormous flower/stigma length 20cm. 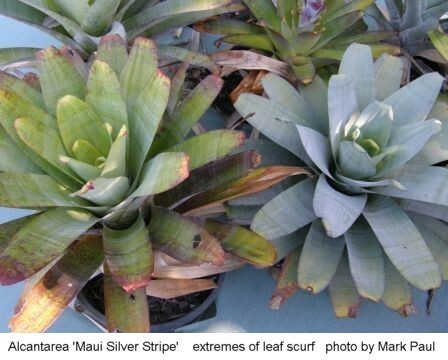 Foliage varies from solid silver to quite green. Mature plant 0.7-1m x 0.6-0.8m high. When flowering 1.8-2.5m high."